My Favorite Dinner Rolls show up at almost every celebration meal in my family. They have recently been updated with the Tangzhong method. It’s a slight modification that makes a big difference. This yeast roll recipe will give you everything you could want in a dinner roll: light, flaky, flavorful, and versatile. Just like 98% of my bread recipes, this one is written for a bread machine. For this reason, the directions will tell you how to mix, knead, and allow the dough to rise in a bread machine, then bake in a conventional oven. The whole process usually takes around 3 hours. What if I don’t have a bread machine? No worries! See the notes at the end of the recipe for using a stand mixer or making by hand. What’s different about these, you ask? If you are among the many who tried the original “My Favorite Dinner Rolls” and loved them like we do, the first thing you might notice is the different shape. Cutting and slicing beats making little balls, especially for beginners. Admittedly, they don’t look quite as perfect, but that also means they won’t be mistaken for store-bought rolls. They’re more fun to eat, too. Who doesn’t love to unroll the layers of their dinner roll? How Did the Recipe for My Favorite Dinner Rolls Change? Not so obvious are the changes I’ve made to the original recipe itself. Borrowing from the Tangzhong method, instructions are included for making a thick paste mixture with a portion of the milk and flour. This only adds a couple of minutes to the process. You will be rewarded with bread that is more tender and stays fresh longer. We’re talking 2 or 3 days of just-baked-freshness as compared to one day for most homemade bread without preservatives. The amount of sugar called for is reduced by a third from the original recipe. You won’t miss it. At least I don’t. 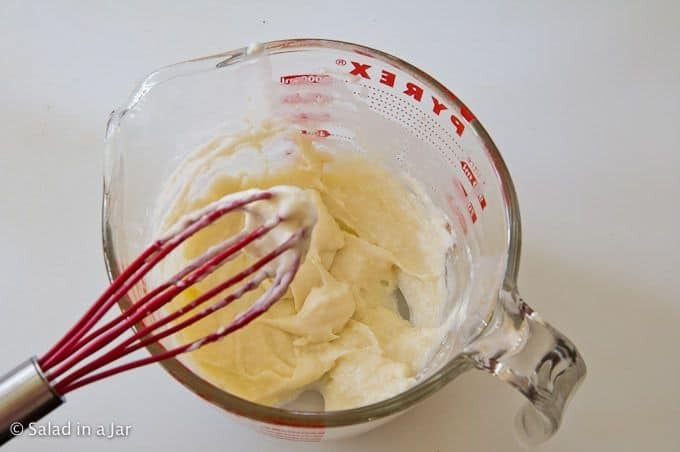 Whisk 3 tablespoons of flour into 1/2 cup of milk. Cook in the microwave for 1+ minute, whisking every 30 seconds until mixture turns into a thick pudding consistency. Don’t worry if there are a few lumps. Add remaining 1/2 cup milk to “pudding” and pour into your bread machine. 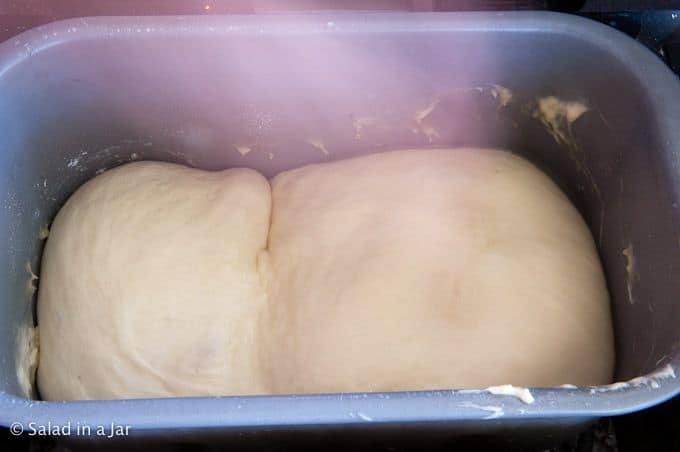 Dough should look similar to this picture when the kneading has finished. After dough cycle has completed, check that dough has risen to nearly double in original size. If not, leave the dough in the machine until it does. 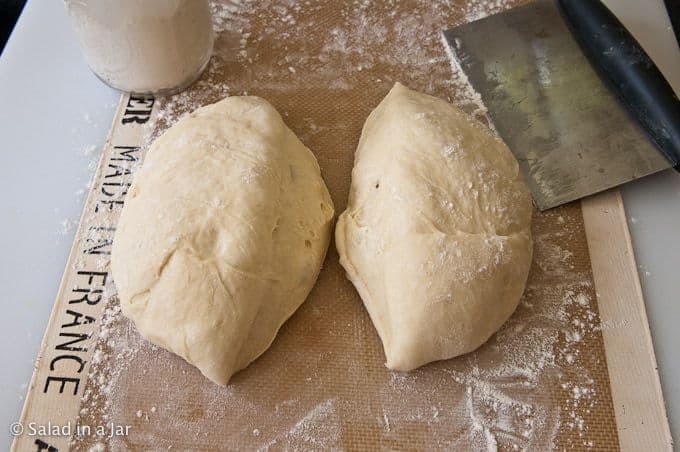 When ready to roll out, two fingers poked in the dough will leave an indentation that won’t fill in. Remove dough from pan to a lightly floured surface. Divide in half. 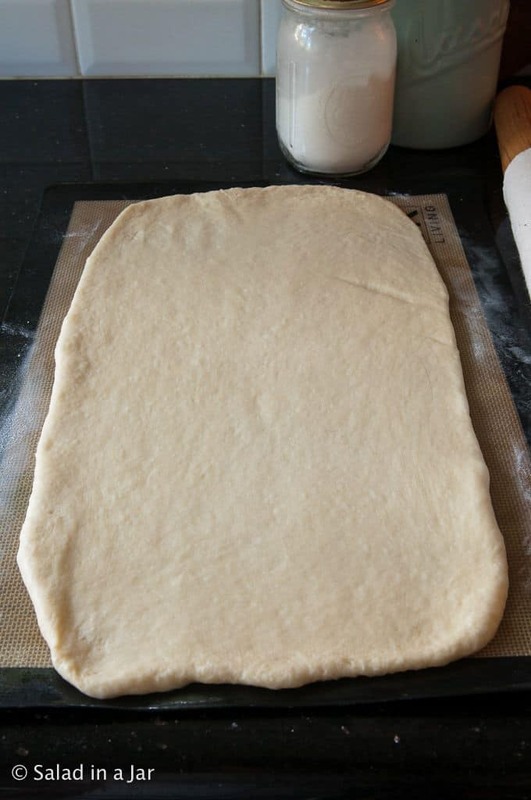 Roll each dough ball into a 13 x 9 inch rectangle. Divide into 4 long strips, then make 1 cut through the middle of the strips to make 8 strips. Roll each strip as tightly as possible. Place rolls in a greased 8 or 9-inch pan in a spoke fashion. Cover with a tea towel (or a cheap shower cap.) Allow rolls to rise until double before baking in oven preheated to 375 degree F .
If rolls are getting too brown before time is up, lay a piece of foil loosely on top. However, be sure they are done in the middle before you pull them out of the oven. “Doughy” interiors will cause them to cave in as they cool. Having difficulty knowing when your homemade bread is baked through? Buy yourself a quick-read digital thermometer. Bread should be around 185-190 degrees in the oven. I highly recommend this method if you are an inexperienced baker or even if you are experienced. Since I started testing my bread with a thermometer, raw bread is past history in my kitchen. Measure out 1 cup of milk. In a separate small bowl, measure out 3 cups flour. 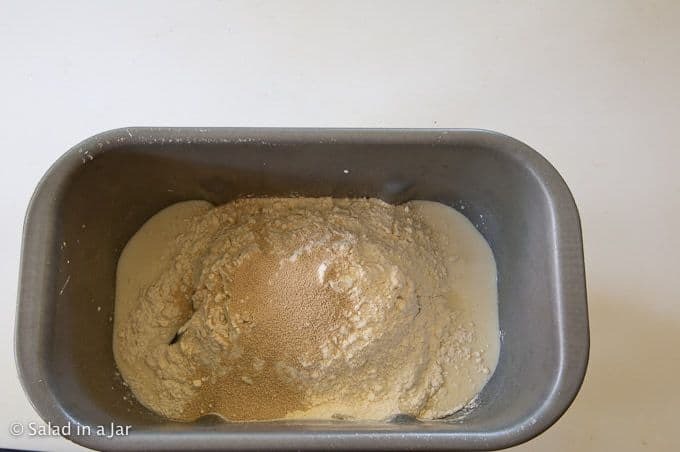 Make flour paste by whisking 3 tablespoons of the flour you just measured out and half of the milk (1/2 cup) together in a medium microwave-safe bowl. Cook on High in the microwave for 1 minute, whisking every 30 seconds. Cook an additional 15-30 seconds, if necessary, until mixture is as thick as pudding. Add the remaining 1/2 cup of milk to the cooked milk/flour mixture and whisk energetically. It's OK if there are still some lumps. They will disappear in the mixing process. Add to the bread machine pan. Add egg, heavy cream or egg yolk, sugar, salt, softened butter, remaining flour, and yeast to the pan and select the dough cycle. Press "Start." When dough cycle finishes, check to see if dough has risen to double its original size. If so, remove it to a floured surface. 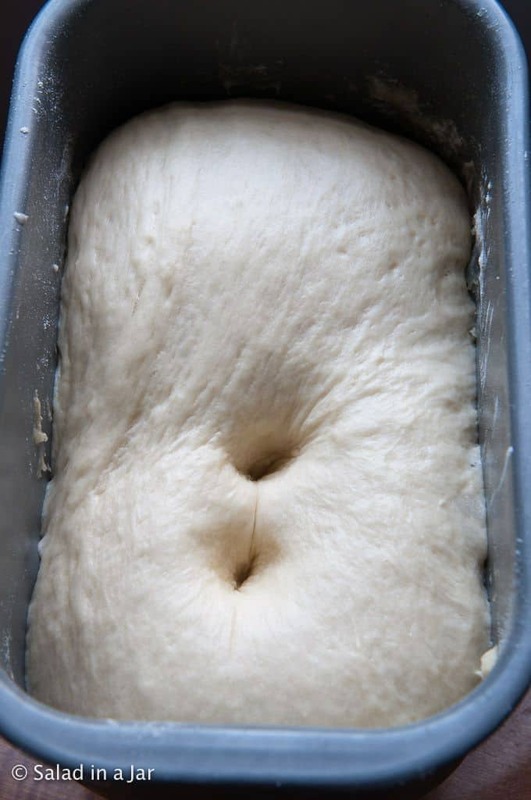 If not, allow dough to remain in the machine until it is double, then remove and proceed with the next step. Divide dough in half. Form each half into a neat ball, flouring the surface you are working on as needed to prevent sticking. 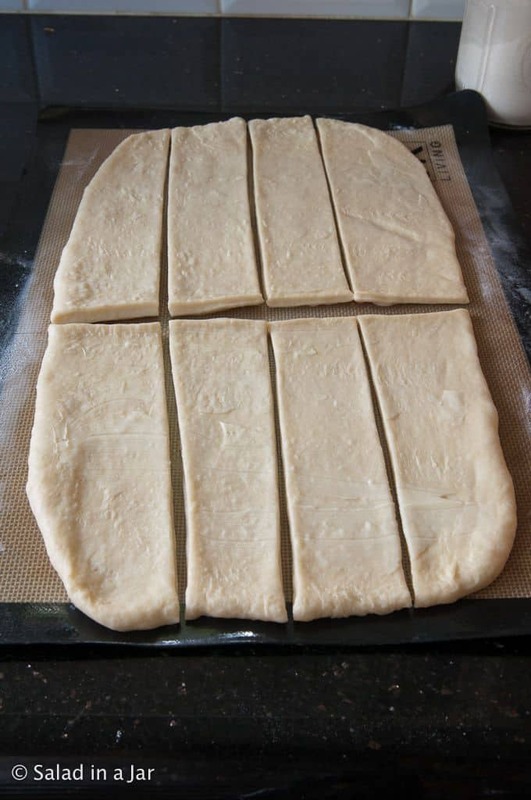 Use a rolling pin to roll one dough ball into a 13 x 9 rectangle. Coat with very soft butter. Divide into 4 equally-sized strips long-ways, then divide each strip in half short-ways. You should have 8 total strips. Roll each strip starting from either of the short ends. 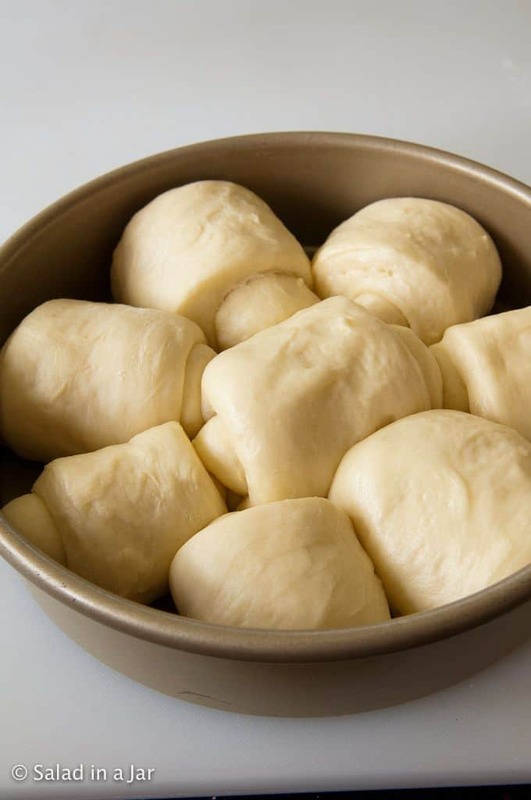 Place rolls into a greased 8-inch pan. Repeat step two with the other half of the dough. Cover with a tea towel or cheap shower cap and set aside to raise again until almost double. This will probably take an hour, plus or minus, depending on the room temperature. Preheat oven to 375 degrees F when you think the rolls are almost ready. Bake rolls on the middle shelf of your oven for 15-17 minutes or until nicely browned. To make this recipe in a heavy-duty stand mixer, add all ingredients to the bowl (except butter) in the same order listed. Turn on low to mix all ingredients until moistened. Using dough hook, turn speed to 2 or 3 and continue beating/kneading until dough becomes smooth and elastic, about 5-10 minutes. Add softened butter and continue to knead with mixer until fully incorporated. Cover and allow to rise in a warm place. 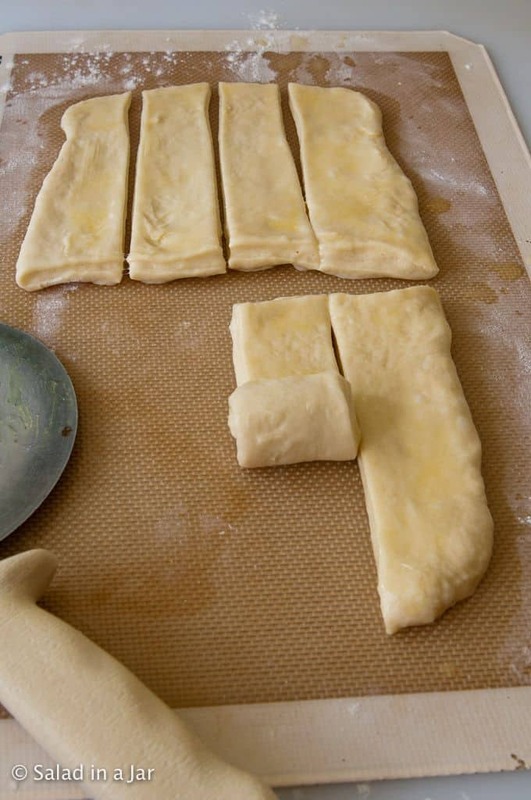 Deflate dough gently and shape rolls as indicated in recipe. These are by far the most amazing dinner rolls I have ever had!!!! Light, fluffy, buttery (but not greasy). Absolute perfection! I can not thank you enough (neither can my family). Hi Paula. I make your oatmeal sunflower bread all the time and have also made rolls from your recipe for the holidays. Could you use the tangzhong method with the oatmeal sunflower recipe? Love all your recipes and enjoy reading your blog so much. Thanks for sharing. Thank you for your kind words, Connie. They brightened my day. Yes, you could apply the Tangzhong method to that bread. You would just have to work out the proportions of dry to wet ingredients. 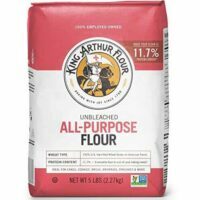 King Arthur Flour has some good advice for doing that. Thanks for this update! My son likes those Pillsbury crescents –me,not so much. Maybe the increased flakiness of these will satisfy him. I’m always looking for ways to get away from “convenience” foods that seem more like”Frankenfood” to me. I avoid using the microwave whenever possible. Could I do the floor and milk thing in a small sauce pan over low heat on the stovetop? Thanks for posting this update. 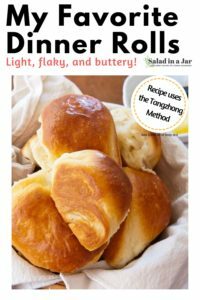 If they are anything like the original dinner rolls (which has become my gold standard bread recipe), I know they will be a hit in my house! I would love to know what you think after you try them. Thanks for writing! I am very excited to try this recipe, I loved the original. 3 T + 8 T, and 1 c is 16 T.
So I looked at the pictures to see if they would clarify things. The caption under the first picture says 3 T flour with 1/2 c milk. Now I am more confused than ever. Have people just been using the 3 T and 1/2 c of milk? Oh my. Huge mistake on my part. The captions on the pictures are right. However, I got it backward regarding the paste mixture in the recipe. And I can’t even tell you how many times I proofread that recipe. Anyway, I have corrected it now. It should be 3 Tablespoons of flour and 1/2 cup of milk to make the paste. Then add the other half cup of milk to the paste mixture. You will add the remainder of the flour along with the other ingredients. If that is not clear, please write back. Thanks again for alerting me to the error. Hope you enjoy the rolls. I think you have a typo in step 1. Shouldn’t it be 1/2 c. milk and 3 T. flour? YES, yes, yes. You are right, Commonsensemom. I have corrected the recipe. So sorry for the mix-up. My mom has passed on for some years now and these rolls are the closest I’ve tasted to her recipe. They literally brought tears to my eyes. I’m the only one to have kept most of her recipes in the family but she never shared her dinner rolls recipe with anyone, it went with her. oh and the recipe was just fine in my mini breadmaker. This recipe is a keeper 🙂 I just made tonight and it’s very good. My husband love it! I used all purpose flour coz I run out of bread flour, it turns out good. 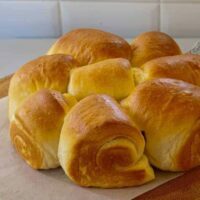 Seriously, these are THE best rolls/bread that I have ever made….and I’ve made a lot. They are so light and fluffy and buttery…Omg! All 4 of my kids (8-17) LOVED them. Thank you so much! are you leaving the dough in machine entire dough cycle ? or just for a short time? Good question. I leave the dough in the machine for the entire cycle. 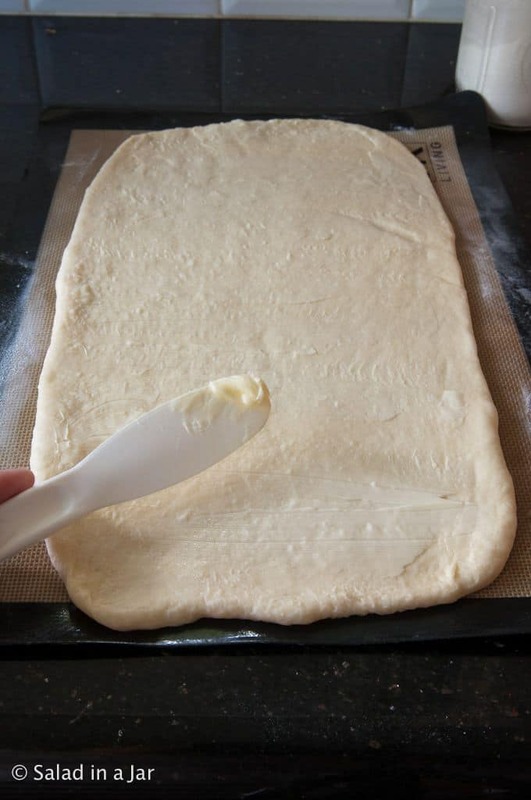 The object is to allow the dough to rise until double before you remove it, punch it down, and shape it. 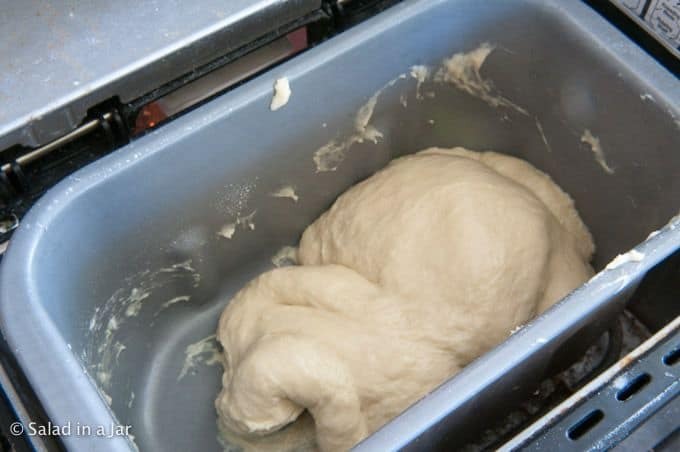 You can remove the dough anytime after it has been kneaded to a different bowl to rise in a warm place if you want. For example, if you need to make two batches for a large dinner party: Mix and knead first batch, remove dough to greased bowl and set in a warm place, then start over again with a second batch. Hi Paula, I would like to add chocolate chips into the bread…should I just add it together with other ingredients before the dough cycle OR after the dough first proof and knead in? Definitely do not add them in the beginning. Either add them when your machine beeps for “add-ins,” or if you miss that or your machine doesn’t beep, knead in by hand after the dough cycle completes. Sounds yummy. I made the same the other night and my husband loved them so much I am no longer allowed to buy rooms in a store! He enjoyed them so much I decided to make a leftover pot pie and use the recipe instead of a pie crust.. Needless to say that was a huge hit also! I baked the bottom of the crust slightly first so it wouldn’t be doughy and it turned out perfect! I can’t thank you enough for this post! I’ve tried both bread and buns in my bread machine and they are always too dense and hard. These buns came out beautiful, soft and fluffy. The tip to check the moistness during the first 10 minutes was the reason I finally succeeded as I added extra water. We live in a dry climate. I also sifted the flour this time. What would happen if I don’t use heavy cream and just skim milk? Just made these tonight to go with dinner and we LOVE them! The perfect go to roll! 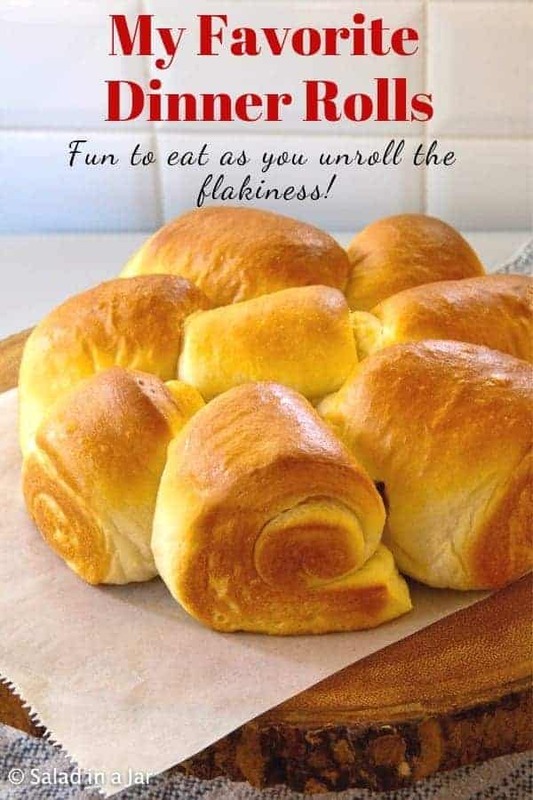 These will definitely be replacing my usual roll recipe that I use for Thanksgiving this year. The only thing I wish I would’ve had thought to do was to use half of the dough for dinner and the other half for cinnamon rolls (I spotted your recipe after they were already in the oven!) instead, but oh well, next time! I made these finally, and was so impressed by how they turned out. My husband loved then, and I loved the confidence they gave me!! Thanks for the recipe! Off to try some sweet bread! Uh oh! Another successful bread maker on the loose. Enjoy! Tonight I made your Favorite Dinner Rolls for the first time and they turned out so well! (I attached a link to a picture on facebook) Your video on how to make the rolls round was so helpful. I actually baked them in a whoopie pie pan (which is why there is a rim around the bottom.) I will definitely make these again! You make an excellent point about the belt, which I had not thought of. I am eager to fix this problem so that I can try your rolls—that is what this is REALLY about. Hi! I happily ran into your website! I am a self-taught breaf machine user and I also have more than one machine and I also refuse to bake iside the machine, because honestly. . . Yuck. But, yes. . . Beautiful loaves in the right pans 🙂 So, I want to knmow about your technique regarding the dough setting. Do you use the 45 minute setting or the 1 and 50 minute setting when you say “dough setting.” I have often wondered about which one I should truly be using. Also, how long do you leave your loaves in the oven. I am always second guessing this. I use a meat thermometer to check once it is out, but always wonder. . . Anyway thanks so much! God bless. Please forgive my delay in answering. Somehow, your question fell through the cracks. I always use the longer dough cycle for best flavor. The time varies with each machine but usually a minimum of 1 hr. 30 min. Yes, you kinda have to guess at how long to leave the loaves in the oven and at what temperature. You might find this post helpful. Hi, Thank you so much for such a wonderful recipe. I used the variation 2 cups unbleached and 1 cup whole wheat flour. They were a BIG HIT in the dinner I took them to. Yummy !!! Sure will make again again. Thanks again. You’re welcome, Mona. Thanks for writing. Glad to hear it Mona. Sounds yummy AND healthy. Rolls are rising now…. very anxious to try! Such wonderful reviews. I borrowed my mums bread machine last week and made a very poor first loaf of bread in it, but then discovered your website – I agree -why would you cook the bread in the machine and end up with a funny shaped loaf with a hole in the bottom? I tried your dinner rolls as my second ever attempt at bread. OMG they were amazing – so quick and easy to do, I just kept saying…I cant believe I actually made these!! My kids loved them too so tonight we are trying your pizza dough which is churning in the bread machine as I write. Fingers crossed it wasn’t just beginners luck!! Thanks! I’m curious if I’m supposed to melt the butter before adding or just dollop it in it’s solid state. Emily, No need to melt the butter. I use room-temp butter and slice it small. 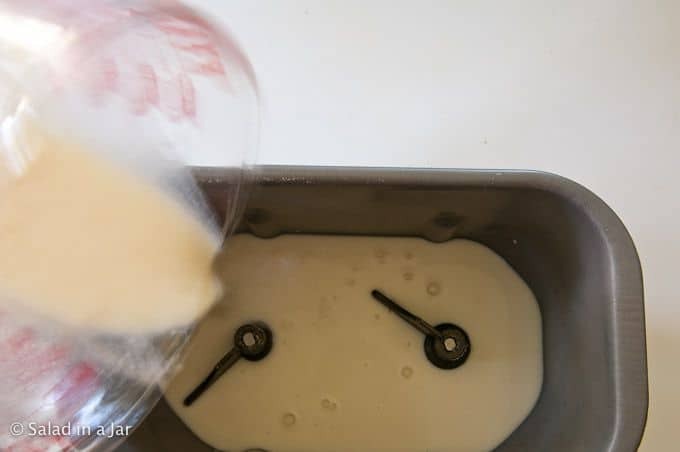 OR if my butter is cold, I slice it up, put it in the pan first, and pour the hot milk over it so it can get soft while I’m measuring the rest of the ingredients. I do not normally prepare these a day ahead. They are just so much better when all done the same day. I have occasionally used the dough for cinnamon rolls and prepared them up until the final rise and then refrigerated. You have to allow a lot more time for the rolls to come to room temperature and rise if you do that. I much prefer to use this dough or this dough when I want to make rolls the day before. Something about having potatoes in them is magic. Both of these recipes make great dinner rolls and cinnamon rolls. Again, do every thing the day before including the roll-out. Then refrigerate. 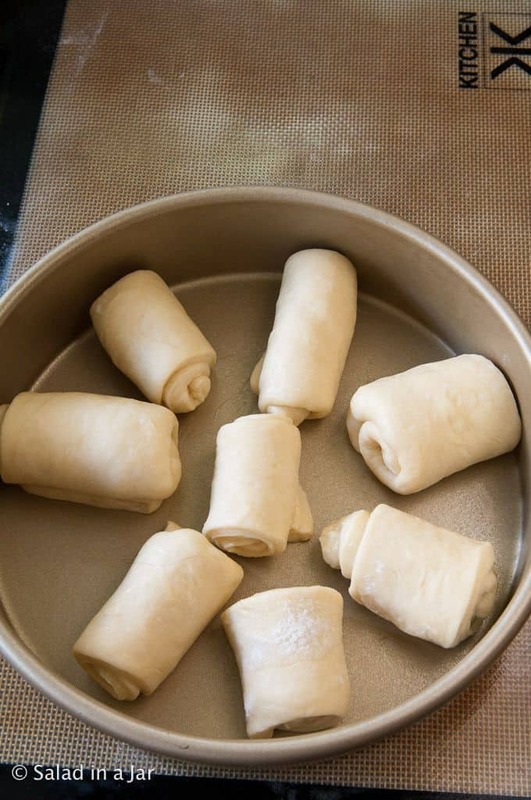 Allow a couple hours for rolls to rise the next day before baking although the time will vary a lot depending on the ambient temperature where you let them rise. They are so delicious. Thank you Paula for sharing. Thank you for the great recipe! I tried these dinner rolls twice already, and my entire family really enjoyed 🙂 Thank you, Paula! I’m having such a great time in your blog! My husband got me a Bread Machine ( just like yours) and I am struggling to make bread. He is from the US so loves and misses fresh bread his Mom made. So, it was lucky to find your Blog. I am going to follow your suggestions and try again to make dinner rolls. Practice makes perfect when it comes to yeast bread. You’ll get the hang of it quickly. Write back if you run into trouble. Could you use whey (from strained yogurt) in part of this recipe?? I’ve never tried it. I like milk because of it’s tenderizing effect. Where I would use it is in French bread. Made these yesterday for my bella familia for the first time!! 16 rolls were NOT ENOUGH for our familia of 6! Better cooled down but still warm. These rolls don’t even need butter put on them!!! Thank you for sharing your recipe. One question…mine stuck in baking dish 🙁 was I suppose to grease bottom and sides of dish? Familia wants to make again and a batch of cinnamon rolls with this dough! We have a keeper recipe! Grazie!! Ciao! YES! You must grease the pans. I usually spray with PAM or similar product. Even better is Baker’s Joy. I also use non-stick pans. They they will fall out in one beautiful piece and nobody will believe you made them because they look so perfect. BTW, these do make absolutely fabulous cinnamon rolls, as you may have already figured out. I added the part about greasing the pans to the directions. Thank-you so much for alerting me. Looks good. I recognized the music in the background. Instrumental version of Gordon Lightfoot’s Early Morning Rain. My mom’s a big fan. Any good proven substitute for the shortening in these dinner rolls? I just can’t bring myself to use it, and not sure how butter would work or eliminating altogether? Has anyone tried, or any suggestions? Butter is a wonderful substitute for the shortening. I don’t use the shortening anymore myself. I LOVE these rolls! My parents want me to make them for Thanksgiving but because I’m going to need 2 batches of them I was wondering if they can be frozen before they are cooked, so that I can easily pull them out and cook on Thanksgiving? Please let me know at what point can they be frozen? After they have gone through the complete dough cycle, then made into balls, then frozen before they are set out to rise? I’m having fun again with my bread machine because of your website. I have tried freezing the dough balls. While they are good and better than store-bought, I don’t think they are as good as the fresh. A better option is to make the dough the night before and let it rise once before making it into balls. Refrigerate overnight. Remove from the fridge a couple hours before you want to bake them. Thankfully, you have some time to experiment if you like. Have you tried the cheesy rolls? They are fabulous for ham sandwich sliders. Thank you Paula for this amazing blog. I am new to bread baking and have made your garlic bread yesterday and they were amazing. I have tried many other recipes before and something was always wrong. I am planning to make these dinner rolls and my only question is can I use butter instead of margarine. With the summer season coming up it is time for hamburgers and I was wondering what recipe do you use. I have tried a few of your other recipes with great results. Hope you can help. Love your recipes keep up the great job in helping us beginners. I used this fabulous recipe as the dough for our Easter “Empty Tomb Rolls.” (To make them, dough is wrapped around a marshmallow, then dipped in butter and cinnamon sugar. After cooking, the rolls are hollow inside with a sticky marshmallow coating.) The original recipe calls for frozen bread dough, but Paula’s recipe is so much better. Thank you, and Happy Easter! I saw recently on Pinterest that you can also put your pans on a heating pad to help the dough rise. Has anyone tried that? I like to do as much prep work in advance. Is there any way to make the dough and then not bake these rolls for a few days? Or do you need to bake right way? If so, can you bake the night before serving? Any suggestions? Thanks! This reply is very late but maybe the comment will help someone. When I want to make rolls ahead of time, I make them until they are shaped. Don’t let them rise. Place saran wrap directly on top of the rolls and put in the fridge. They can stay there for up to 48 hours (but really, 24 hours is better). Pull out of fridge and let rest at room temp for 30 minutes before baking. I’ve done this countless times with much success. I got the tip from a cookbook years ago. Hope it helps! Thanks for sharing this trick. I agree that 24 hrs is better than 48. Sorry for a silly question but do you beat the egg at all before you put it in or just put it in whole? Thanks. I made these on Monday and my kiddos are already begging for more! What a hit! Thanks so much for the great recipe and the video tutorial for this inexperienced baker! Uh oh! Now you’ve started something you may have to continue for the rest of your life. 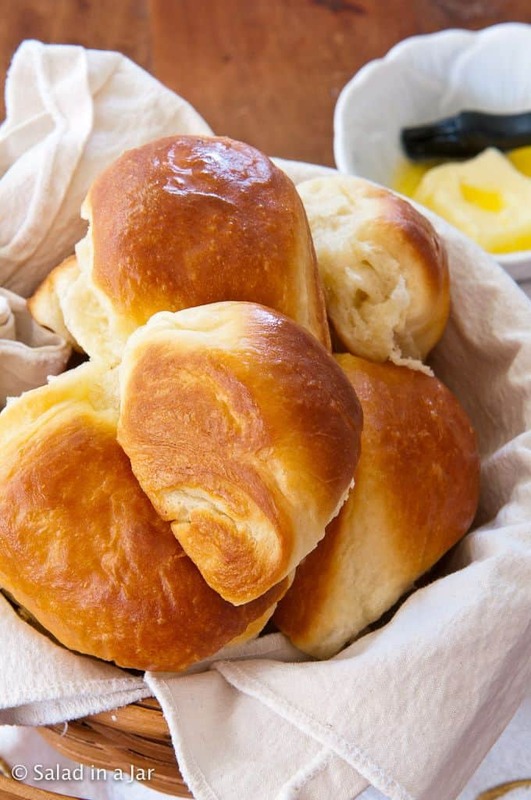 It’s a great tradition–mama’s homemade rolls. Makes any meal more special and delicious. It’s also cheap. When my boys were young and we were poor, we ate a ton of homemade bread. Filled them up and saved money. I just wanted to let you know, that I make the round pieces and then I put them in a cupcake pan and let them rise and bake in there. I love the shape…reminds me of brown and serve rolls my mom used to buy at the store. I am so glad to have found you. Just began making bread, grinding my own wheat etc. and have not had much success. My baked bread looks nothing like yours and while it is good it’s not delicious. I have so many ideas from you I am actually looking forward to trying again and being able to use my bread machine just for dough! Keeping my fingers crossed. My dough is in the bread machine right now. I’ve not used this recipe before so I thought I had better make a test run before tomorrow. Nothing like waiting until the last minute. My husband is disappointed that I am not making my grandmothers angel biscuits (really soft rolls- don’t know why they are called biscuits). They are soooo labor intensive that I am hoping these will win him over and he will be a convert!! I love, love, love your site. Especially the microwave shortcuts. (made the brown butter icing last week for cinnamon rolls…AMAZING! Took them to a whole nother level. Suzanne sent me this link to these rolls. I love this recipe. Super easy and fast. And I love the whole wheat option. Thanks you for publishing these. First, I have to say, your website is just jam packed with amazing recipes. Actually, I’ll be making some cheesy dinner rolls for Thanksgiving. to its fullest and enhance flavor. Maybe this will help in the making of wheat bread. I don’t think I ever commented on your blog how much I LOVE these rolls! They turn out so tender and soft. Thanks so much for sharing! Just noticed you make cinnamon rolls with the same dough, looking forward to trying that myself! Thanks for coming back to say so. I’m working on a whole wheat version right now. Just as good. 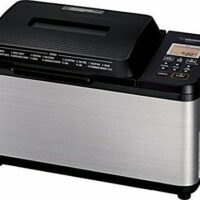 Hello, I’m a newbie to the bread machine and so this question may seem silly: Can I put the ingredients for any recipe in there and press the dough cycle if I don’t want it to bake in there? I have a book with recipes, but the directions explain what buttons to push for it to bake inside… And as you’ve suggested, I’d like it to only make the dough so I can shape it and bake in the oven. Thanks! I love your recipes. You are amazing. Thank your for being so kind to share and spreading happiness all over the world. Is there a stage of the sweet milk bread, where you could freeze it and take it out and let it thaw, rise and bake? Cecelia, I have frozen them before. Not as good as straight out of the oven but good enough if you don’t keep them more than a couple weeks. Thanks for the feedback Paula. There are only two of us in the house and it’s nice to be able to freeze some items for future use! I’m making these tonight for dinner with friends. These dinner rolls are the absolute best! My family thanks you for the recipe… I have made them twice a week for the past few months, and they never get tiring. They are light & fluffy, and a definite keeper. Thanks! 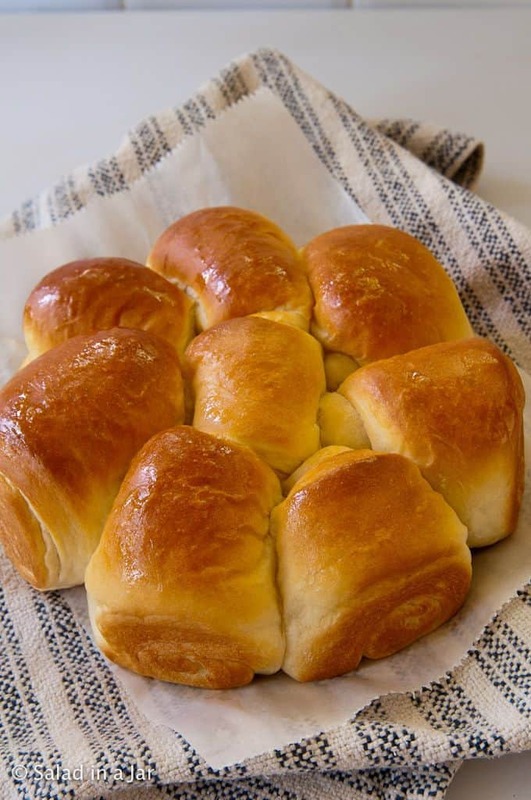 I would like to share your dinner rolls recipe with my sister in lawabroad. Can she use all purpose flour instead of bread flour since she can not find bread flour at her local grocery store? It would be her first time to bake bread and she is very excited to do it. Thanks. Yes, she can definitely use all purpose. Unbleached is better than bleached but bleached will also work. Normally, you have add a little more flour if using unbleached instead of bread flour and maybe even more if using bleached flour. I hope it works out for her. Working with yeast dough is a little tricky and takes practice. Thank you for your favorite dinner rolls recipe. I used your dinner roll recipe tonight with the use of bread flour. Like you said, it was so soft, tasty and light. Everybody in my family enjoyed it.